Have you ever looked at a gear drawing and been overwhelmed by all the different specifications, wondering what it all means? Gear terminology means all definitions used to describe a gear or the terms used to design a gear.Let's know the terminology used in Gears .Gears are widely used in mechanical industries for power transmission. It is used where small distance between driver and driven shaft. It is the only positive drive which can transfer exact velocity ratio to the driven shaft, that’s why it is widely used in various machines and other mechanical devices. The following terms, which are mostly used to describe a gear, are as follow. 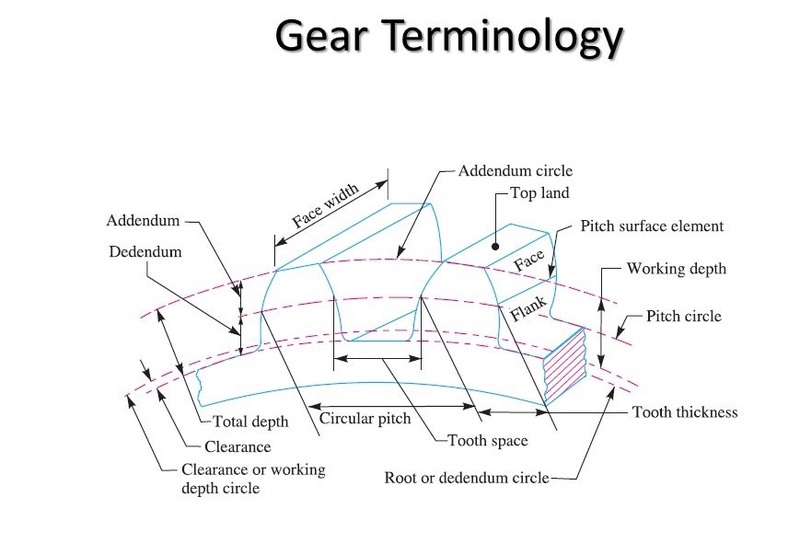 The quantity of teeth on the gear. This term becomes slightly more complicated if sector gears are specified, in which case the manufactured quantity of teeth will be called out along with the total number of teeth of the full gear. The quantity of teeth per inch. It is an imaginary circle which is in pure rolling action. The motion of the gear is describe by the pitch circle motion. The diameter of the pitch circle from the center of the gear is known as pitch circle diameter. The gear diameter is described by its pitch circle diameter. When the two gears are in contact, the common point of both of pitch circle of meshing gears is known as pitch point. Pressure angle is the angle between common normal to the pitch circle to the common tangent to the pitch point. Distance between the pitch circle to the top of the tooth in radial direction is known as addendum. Distance between the pitch circle to the bottom of the tooth in radial direction, is known as dedendum of the gear. The circle passes from the top of the tooth is known as addendum circle. This circle is concentric with pitch circle. The circle passes from the bottom of the tooth is known as dedendum circle. This circle is also concentric with pitch circle and addendum circle. The ratio of the pitch circle diameter in millimeters to the total number of teeth is known as module. It is reciprocal of the diametrical pitch. When two gears are in meshing condition, the radial distance from top of a tooth of one gear to the bottom of the tooth of another gear is known as clearance. The circle passes from the top of the tooth in meshing condition is known as clearance angle. The sum of the addendum and dedendum of a gear is known as total depth. It is the distance between addendum circle to the dedendum circle measure along radial direction. The distance between addendum circle to the clearance circle measured along radial direction is known as working depth of the gear. Full depth is sum of the addendum and the dedendum. Face width is length of tooth parallel to axes. The axial distance required for a helical gear tooth to make one complete revolution around the gear. The gear tooth depth from the tip to the root. Diametral pitch (p) is the number of teeth per unit volume. Gear ratio is numbers of teeth of larger gear to smaller gear. Pressure line is the common normal at the point of contact of mating gears along which the driving tooth exerts force on the driven tooth. Pressure angle is the angle between the pressure line and common tangent to pitch circles. It is also called angle of obliquity. high pressure angle requires wider base and stronger teeth. The tooth angle relative to the central axis. Helix angles typically range from 10° to 45° depending on the design requirements. Gears with 0° helix angles are called spur gears. Helical gears (over 0°) increase contact ratio and improve gear noise, but also produce an axial load that has to be accounted for in the bearing design. The direction of the helix angle expressed as either right or left. Looking down the central axis of the gear, a right hand helix angles from left to right down the tooth face away from you. The opposite is true for a left hand helix. Distance of the tooth measured along the circumference of the pitch circle is known as tooth thickness. The tooth thickness measured normal or perpendicular to the central axis of the gear—also at the pitch diameter. The tooth thickness measured normal or perpendicular to the helix angle—also at the pitch diameter. The theoretical tooth thickness that accounts for manufacturing process errors. Distance between the two adjacent tooth measured along the circumference of the pitch circle is known as the tooth space. It is the difference between the tooth thickness and the tooth space. It prevents jamming of the gears in meshing condition. It is the curved formed by the face and flank is known as profile of the tooth. Gear tooth are generally have cycloidal or involute profile. The curved traced by the point of contact of two teeth form beginning to the end of engagement is known as path of contact. It is the curve traced by the pitch point form the beginning to the end of engagement is known as arc of contact. The portion of the path of contact from beginning of engagement to the pitch point is known as arc of approach. The portion of the path of contact form pitch point to the end of the engagement is known as arc of recess.